My satellite phone rang. It was my contact from the "Blackbird" network. He was in Thailand or the United States; I was not sure which. He said, "You find them? They find you? No? Keep going!" I continued to hike into the jungle alone, searching, lost for hours. Suddenly they appeared like ghosts from the forest and snatched me from my exposed position, pulling me up into the jungle. When we stopped, I realized all six of them were afraid of me but also excited. They were soldiers, dressed in battered army uniforms and carrying antique AK-47's. They had never met anyone from the world outside the jungle — let alone a white American. For them, I was an alien from another world, an aberration of an ally from the past. They stared at me in awe, my skin, my clothes; it was all foreign to them. Then the men innocently looked at everything I had, trying to discover what simple items like a paper clip were. Their favorite item was the blower brush for my camera, and they took turns blowing it at one another laughing. I was in the company of the Lao government's most wanted men — the Hmong rebel resistance. I found them through the Fact Finding Commission (www.factfinding.org), a humanitarian group in California. A few years ago the Fact Finding Commission distributed satellite phones to the Hmong hiding in the jungle to document their treatment by the Lao government. They used a loose network of individuals called the "Blackbirds," who do what they can to help the people hiding in isolation. 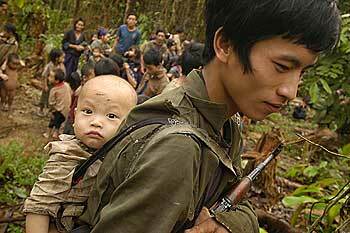 The ragtag Hmong guerrillas are one of many small groups estimated to number between 2,000 and 12,000 still hiding in the mountains of Laos. For the last 30 years, their only contact with the outside world is said to be with the Lao and Vietnamese communist soldiers who are hunting them and their families. The Hmong jungle people are the remnants of a "secret war," a counterinsurgency sponsored by the C.I.A. during the Vietnam War. Both the Americans and the communists kept this war secret, even though it became one of the most intensive bombing campaigns in world history. My satellite phone rang again; it was the Blackbird, "They find you? Good! You follow. You follow them all night. Don't stop. You go all night. Be careful. I pray for you. You no stop three to four days. Be careful! Don't stop! Keep going!" Night fell and I struggled to follow the men for hours into an area no outsider had seen since the C.I.A. left in 1975. There were no people, no villages, just darkness and Lao military patrols hunting us. In the dense jungle, I struggled on hands and feet up 65-degree mountainsides, falling constantly, my heart bursting, lungs spent, with soldiers pushing me up from behind and pulling from the front. I was a huge liability, and it made them edgy. Government soldiers were patrolling the area and I had taken away the rebels' greatest defense — their ability to appear and disappear like panthers. I did my best to follow, but the Hmong do not use old trails or zigzag up a mountain. They go rapidly — straight up — always cutting new trail though jungle so thick it would trap a rat in its web. The six men guiding me were young, aged 15 to 25, all short, not more than five feet tall, lean and ripped with muscles. I marveled at their skill to walk up a technical climb, with their rifles, 30-pound packs, slicing trail with machetes, never breaking a sweat. They could go for days without stopping. Everything I had heard about them was true. They were completely adapted to the jungle. Bill Lair, C.I.A. veteran, counterinsurgency expert, and recognized founder of the C.I.A. 's Secret Army, said to me about the Hmong, "They were probably the best guerrilla fighters anywhere in the world. They moved so quick over those rugged mountains, you'd swear a helicopter moved them around." We stopped to eat. One soldier unloaded his United States military issue backpack held together by a quilt of scavenged fabrics. He pulled out an assortment of pots and pans fabricated from American and communist bombs. A few minutes later I was eating a boiled wild yam from those same bombs and some meat. Another soldier flashed a light into my bowl and I saw an animal paw. I looked up to see the guerrilla smiling, jumping up and down, acting like a monkey — imitating what I was eating. By the third day I was suffering from exhaustion, covered in mosquitoes and leaches. My legs did not respond, and my feet were bloody, swollen, and beginning to rot from moisture. After 72 hours of climbing we reached their hidden village, where I found the saddest place I had ever seen. Before me on hands and knees were hundreds of men, women, and children crying and screaming for me to save them from communist soldiers. Their leader approached me and said in Hmong, "Welcome, I am Blia Shoua Her. These are my people. Thank you for coming." I was speechless and unable to cope with the multitude of sorrow. Each of them wanted to tell their story and knelt at my feet with bowls of forest leaves as gifts, which was all they had to offer. Young men missing legs hobbled by on bamboo crutches. Children with bloated stomachs and no clothing screamed for food that did not exist. Most of them, including the women and children, had bullet or shrapnel wounds, and all of them — terrified — were hunted like animals. Blia Shoua Her led me through his muddy makeshift mountain camp to a small bamboo hut with no walls, built for me. He assigned several soldiers to provide 24-hour security during my two weeks in the jungle. Blia Shoua then advised me to keep all of my belongings packed and to be ready to run at a moments notice. This is the way his people in the jungle have lived for more than 30 years — bags packed, ready to go. He explained the entire village was impermanent since they have to flee so often from mountain to mountain. The Lao army surrounds the group, rendering them unable to farm or raise livestock, forcing them to forage in the jungle for anything edible. I came to visit Blia Shoua Her and his group because, they claim, Lao and Vietnamese government soldiers ambushed them on April 6, 2006, while searching for food in the forest. The massacre resulted in 26 killed and 5 wounded. Only one adult male was killed, the other victims were 8 women and 17 children. In the days that followed, 5 infants died because their dead mothers could not breast-feed them. This is only one small incident out of thousands reported and documented since 1975. The Lao government generally denies the jungle people exist or that any of this is happening. I photographed the massacre scene and brought back witness statements with video, but when I called the spokesman for the Lao Ministry of Foreign Affairs, Yong Chanthalangsy, he dismissed me outright. He said an investigation had been completed, there was no attack, and my information was fabricated. He refused to supply a written report, and did not deny the fact that no one from the Lao government had visited the crime scene or interviewed any of the 500 jungle people who claimed to witness the killings. Before I left the jungle, Blia Shoua Her, told me his people wanted peace, freedom so they could farm in one place without constantly running. He said his group was not part of a Hmong rebel resistance, just civilians who defended themselves when attacked by their own government. They hope the Lao government would allow them to surrender to the United Nations, a plan the Lao government spokesman also ruled out. On Oct. 10, 2006, 438 people from Blia Shoua Her's group came out of the jungle and surrendered to Lao authorities after reports of more Lao military pressure. Their conditions and whereabouts are unknown, and outsiders including the United Nations have been denied access to them. On Nov. 17, many jungle refugees who had fled Laos, including Blia Shoua Her and his family were arrested hiding in Bangkok. They currently face deportation to Laos, which could mean torture or death. They have been identified as "Persons of concern" by the United Nations, but the Thai are ignoring their status and threatening to deport. These events are a blow to the refugees and those still in the mountains of Laos seeking asylum. The Hmong are probably the only guerrilla army in history to have enjoyed air superiority, led by American airpower and an assortment of nations. Although the Hmong are well adapted to running and hiding in the jungle, in recent years many experts have begun to wonder why the Lao government has not mounted a full campaign to completely wipe them out. Some speculate the Lao military is just using them for live fire exercises. Others think the Lao government hopes they will just surrender, or flee the country, avoiding further attacks by its military. Roger Arnold is a photojournalist who regularly contributes features to World Picture News.